At HAOSCH, quality is very important too. We consider it as the top priority. For this purpose, all parts are tested several times during the entire production phase by qualified specialists in order to ensure the high-quality standards. These and other strict quality requirements are for us the measure of all things.Thanks to the DIN ISO 9001 certification, we ensure a consistently high quality and reliability of all production processes and the associated long service life of our systems. Compliance with the delivery deadlines and dates requested by the customer is important for us. Haosch cooperates with carefully selected transport and logistics service providers. Haosch operates both from his own warehouse in Korntal-Münchingen, as well as from other external warehouses in Germany and in the Czech Republic. As a result, Haosch products reach customers faster and more efficiently. On customer request, Haosch also offers you consignment stock, which is set up and managed close to the customer. Your advantages: high security of supply, low processing costs and low capital commitment on the basis of the discharge of a product from the warehouse. 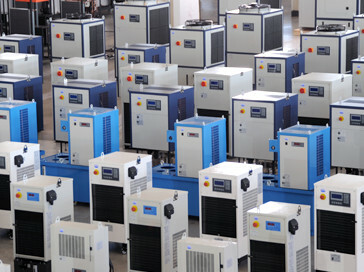 HAOSCH is a young, innovative company which is active in the field of industrial cooling. The company is focused on high-quality, individually customizable and costeffective cooling systems. These are found in almost every industrial sector as well as in the various industrial processes. The powerful and reliable HAOSCH coolers are used worldwide on ships, in power plants, in production halls and in the many other fields. Our customers are always the most important for us. In order to offer our customers the optimal system, HAOSCH stresses great importance to individual and comprehensive consulting. Our team of motivated and qualified specialists is at your service. Customer satisfaction is top priority at HAOSCH. The expansion of the branch office in Stuttgart in 2012 will ensure better direct customer support on site. In addition, Haosch has expertise in the field of lacquering and sheet metal construction, which enables us to operate internal sheet metal processing.